Cooler nights and shorter days are just around the corner. That means it's time to bake up a mess of pumpkin dog treats. The last few months of the year can be very hectic, so stock your freezer now with delectable, sweet and easy to make pumpkin dog treats. 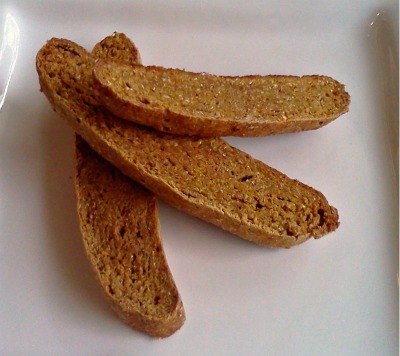 Pumpkin Biscotti for Dogs - This biscotti dog treat recipe has been a big hit with every dog I've encountered. There are a couple extra steps to this recipe, but it makes quite a few treats and is definitely worth the effort. "I made this recipe and I can honestly say that I am lucky that I have all my fingers left. My 3 huskies loved them. Thanks for sharing this great recipe." From now on each month we'll feature one new recipe to try, or a tried and true favorite dog treat recipe. We'll also include a baking tip to make the whole process of baking for your dog more fun and enjoyable. And, every now and then, we'll throw in a product or service that we can't live without. Use the Scoop and Sweep Method for Measuring Flour. That's it, now you have a lighter and fluffier amount of flour in your measuring cup. If you use the method of getting the flour directly out of the bag with the measuring cup, you could be putting up to 30% more flour into your recipe. This results in a much dryer dog treat dough.